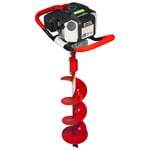 Earth augers make it faster and less excruciating. They come in one-man or two-man styles, and the bits can be changed for different jobs. The size of the holes you need to dig and the size of the project you're working on are going to determine which kind of hole digger you need. Need to dig a bunch of small holes for a gardening or landscaping project? Your best bet is a one-man earth auger. One-man earth augers typically weigh between 27 and 40 pounds. If you're working alone on a relatively small to medium-sized project, these earth augers will provide you with just the amount of power you need in a tool that's lighter and less bulky to carry. Let's imagine that you and a buddy are building a deck, and you need to dig holes for the load-bearing posts. The best tool for you is a two-man earth auger. Most two-man earth augers weigh between 50 and 70 pounds. 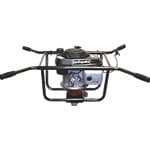 Whereas one-man augers have 35 to 50cc engines, two-man augers draw on the power of 160cc engines and greater. This makes them the better choice for heavy clay-based or rocky soil. Attachments are made for all types of augers. You can choose smaller or larger diameters for holes of different sizes, which will help you take on specific tasks, such as tree potting or fence post digging. In addition to attachments and accessories made for specific projects, you can find extension shafts to help you reach deeper ground with the auger bits you already own. If you need to dig a hole, you can choose all sorts of tools to use, from shovels to post hole diggers. 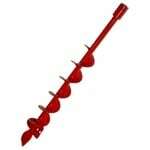 However, the power of an earth auger will help you dig that hole more quickly with less effort. If you have multiple holes to dig, you'll finish that project much sooner than you would by using a simple shovel. If your outdoor project is looking daunting, don't dig yourself into a hole. Dig your holes with an earth auger instead! Earth Auger Buyer's Guide.. Our Power Equipment Direct how-to library can help you learn about How to Grow Crops with Raised Rows or Beds, Proposition 65 Product Labeling and Sales Tax Information.